The Senior Center of the Kingsbury & Fort Edward Area, Inc. is located at 78 Oak Street in Hudson Falls, between Elm Street and Pearl Street. The Senior Center serves as a vital resource for adults 50 and over in the Kingsbury / Fort Edward community, offering several Programs, activities and classes, as well as other services, trips, and special events. Our goal is to create an environment, that attracts and meets the needs of seniors. This includes socialization information, nutritionally balanced meals, and creative entertainment. The Senior Center is now open Monday through Friday from 8:30 to 4:00pm. Transportation to and from the center can be arranged by calling us at 747-9352. Currently we have a 12 passenger handicap accessible bus and a 14 Passenger handicap accessible Bus. Check out our Calendar or Newsletter for various events and activities. 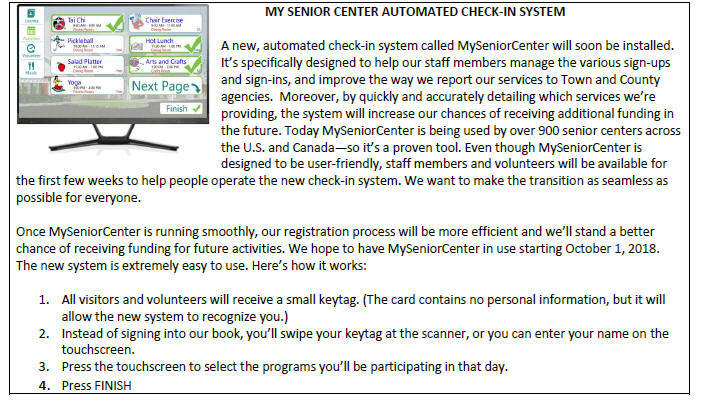 If you have not received your key tag for the “My Senior Center” sign-in system, please ask either Max, Debbie Beahan, Roxanne Jenkins or Debra Williams for help. When you arrive at the Center, you must log in with your key tag and choose ALL ACTIVITIES you will be attending that day. If you forget or decide to participate in something you didn’t check when you logged in earlier, please log in again and check that activity. Our funding is based upon the total number of activities attended. All volunteers, please remember to log in your time on the touch screen kiosk. Membership is open to men and women over the age of 50. Washington County residency is NOT required. Seniors over the age of 90 have a lifetime free membership. Just a friendly reminder, DUES OF $10 ARE DUE APRIL 1st of EACH YEAR Forms are available at the Senior Center. We realize many of you have been away for the Winter or you may have had a “senior moment” and forgot. Please renew as soon as possible to receive your membership card. 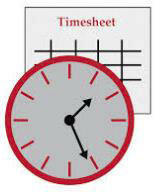 Did you assume that once you retired you didn’t need to keep time sheets anymore? Wrong – if you are one of our valued volunteers, please keep a time sheet in the volunteer book. You may keep a sheet and turn it in at the end of the month or keep it in the book. The reason we need to keep track of our time is that the more volunteer hours we can prove when applying for grant money, the more willing donors are to help us with funding. The Center is in need of volunteers to form a “Welcome Committee”, to help greet new members, introduce them, explain events, etc. Other volunteer activities are also available. Volunteers are a critical part of our Senior Center operation. Without them, we wouldn't be able to run as smoothly, or offer as many programs as we do. Their gift is the most valuable of all: their time. Please let Max know if you would like to become a volunteer Your help would be greatly appreciated. Please see Max McDonnell, 518-747-9352. NOTE: The center is closed when the Washington County Nutrition Program and the local schools are closed because of inclement weather. Listen to your local radio or television stations for school closings.